At one time, Sapulpa had five lumber yards. Now there’s only one. Read about one of the most memorable. Cecil Gibson came to Sapulpa from Pawhuska in 1943 to manage Benson Lumber on East Lee Street. Benson Lumber was originally Whitfield Lumber. During World War II, due to the shortage of lumber, Benson re-milled old oilfield timber to sell to their customers. 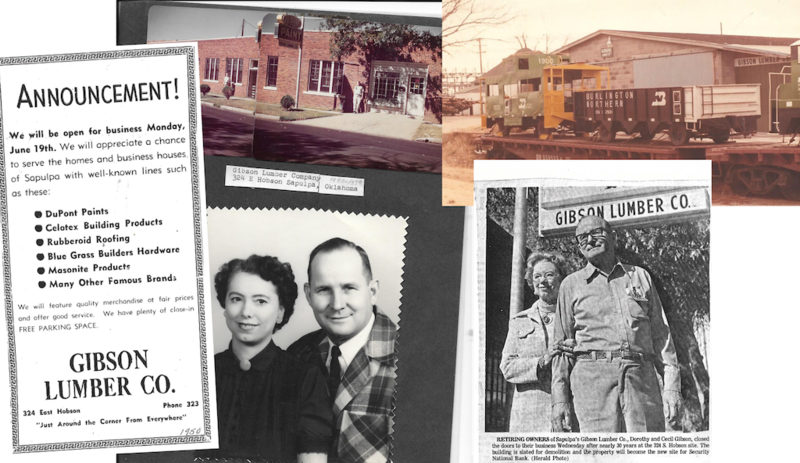 In 1950, Cecil bought the Roger’s Bakery building and together with his wife, Dorothy, started Gibson Lumber. Gibson also bought the building next to the tracks on Hobson Street across from the Creek County Election Board. They stored concrete blocks and drywall in that building. Also in in 1950, Cecil Gibson was elected Mayor of Sapulpa. Ron Gibson, Cecil’s son, told me that when he was growing up, he knew he had better behave. Since his father was a public figure, any misdeeds on his part would mean he would be in big trouble. Cecil Gibson was a man who felt he should serve his community. Besides serving as Mayor, he was involved in many civic functions and was once awarded the “Silver Beaver Award,” for Meritorious Service to the Boy Scouts of America. In 1976, when I opened my first shop, I went to Gibson Lumber to purchase materials to remodel the building. I remember Cecil remarking that the best grades of lumber were being exported to foreign countries. He was very friendly and always had a smile on his face. Ron, his son, told me he treated everyone with respect and dignity and had customers from all walks of life. His father assessed people by their character not by their race, religion or status in the community. Gibson Lumber, which was located at 324 East Hobson, was closed in 1979 after nearly thirty years of operation. Gibson and his wife decided to retire and travel. Several ladies came into Gibson Lumber and started crying when they found out the Gibsons were closing the business. Eventually, the building was demolished, making way for Security National Bank (now First United). Ron said that after his father closed the business, he would run into his Dad’s customers and they would tell him how much they missed having a full-service lumber yard and how they missed the personalized service they received from his father. After Ron Gibson retired from his position at U.S.G (United States Gypsum), he started a garage-door business. He had customers who told him how his father gave them credit when no one else would and they were forever grateful for that. Ron remarked that at one time there were five lumber yards in Sapulpa. Sapulpa still has one lumber yard , Day’s discount Lumber, on West Dewey. Cecil and his wife, Dorothy, left a legacy of customer service and service to the community. In today’s world of “Big Box Stores,” we have lost that personalized service. We have also lost the dedication, compassion, and community service that business people like the Gibsons brought to Sapulpa. I wish to thank Ron Gibson for so graciously granting me an interview and providing photos. I could not have written this story without his help. I must tell you that Ron is “his father’s son.” Just like his Dad, Ron is a kind, congenial, warm-hearted individual who makes you feel better for just talking to him.